For as long as I can remember I've always been uncomfortable with the term' strong black woman'. In my opinion it is just as dangerous as the 'angry black woman' stereotype and I'll discuss why I think so too. 'The ability to withstand force, pressure, or wear'. On the surface it's not necessarily a bad thing and really, who would want to be 'weak'? My issue is that when juxtaposed with 'black' as well it just becomes a double negative stereotype reminiscent of the 'angry black woman'. One has to wonder why women, particularly black women have such terms relating to emotions about them; if you're not angry, you must be strong. what happened to just being black? I know that people mean well and perhaps even see it as a compliment but what I see it as is the erasure of emotions. strong black woman, you may feel that you are not able to show emotions that are seen as contrary to strong. For a long time I was told by others that I'm 'strong' and for whatever reason I felt that I had to keep up that facade because I was not allowed to be anything but strong. I had been put in a box that gave me no room to move. I was expected to react a certain way because that is what a strong black woman does, right? It is worth nothing that the 'strong' word is sometimes used for women in general which I still take an issue to. I understand that situations happen whereby you have no choice but to be strong because maybe your family is depending on it, your children or other people are. I commend the fact that there are black women that rise to the challenge and do what they can to keep it moving but being strong does not have to be the overarching identity you run with especially at the expense of other emotions. You don't always have to put on your 'big girl boots', sometimes wear your slippers and chill. 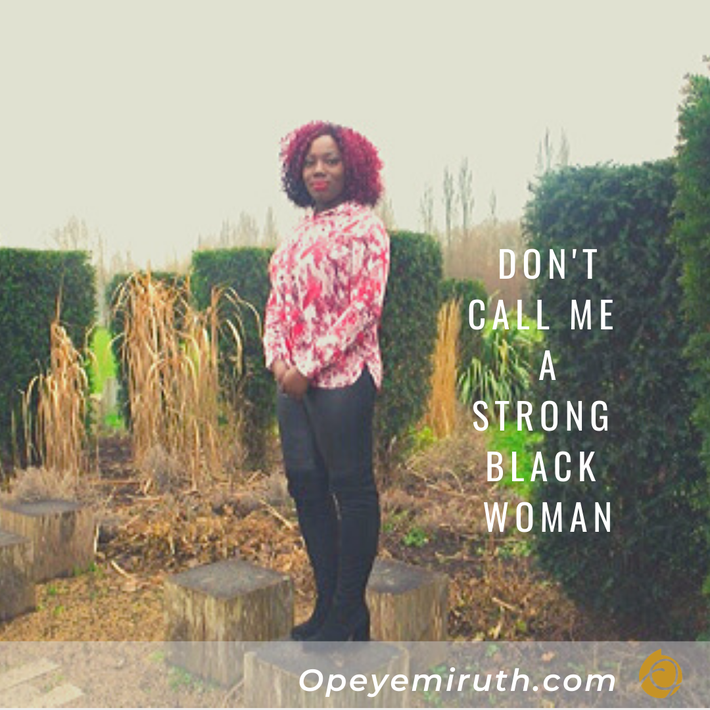 The irony of it all is that I feel as a society we are working towards dismantling the notion that men must be strong and 'real men don't cry' and I think it's about time that the strong black women stereotype is compressed-once and for all. I agree. Seems as if “strong black woman” is another subconscious way to keep us withstanding harsh climates. We deserve a break too! This was an interesting read that grabbed my attention by the title. I never put that much thought into that statement but no do look at it from this angle based on your blog. I definitely agree with your approach though! Black women are always targeted for having to be much stronger than sometimes what is a realistic expectation. Thanks for your comment Dolce! You're definitely right that it can be seen both ways. This is inspiring.. No more masks!